A garden is a gift. It’s a place that teaches many lessons. A child walks into a garden and he or she walks into a world of wonder. Nature brings math, science and literature to life. It brings learning to life. 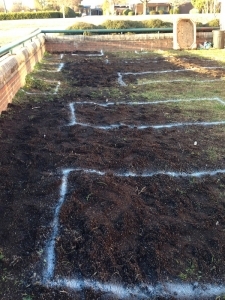 Landscape paint is used to map out raised beds before volunteers arrive. 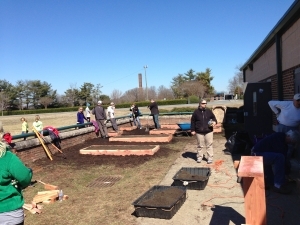 Members of the Davidson College Presbyterian Church in Davidson, North Carolina, gave the gift of a garden to Blythe Elementary School in Huntersville, North Carolina, recently when they gathered to build and install raised beds. First grade teacher Mary Raymond had expressed an interest in volunteers working with her to plan and build the garden. She wanted to start with the first phase, which was four large raised beds, with five smaller raised beds lining the perimeter of a courtyard area off her classroom. Raised beds taking shape and being filled with soil. 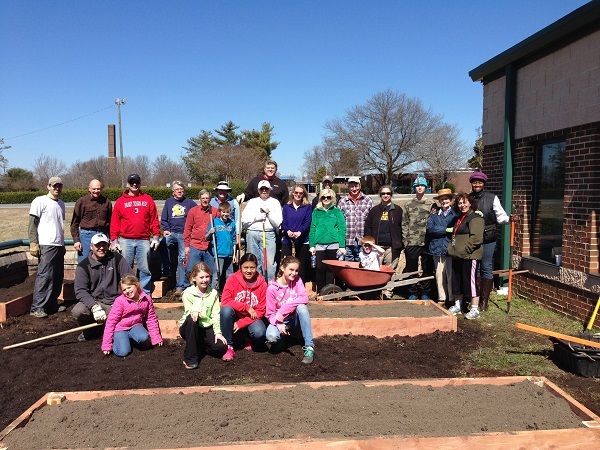 The garden project is one of many volunteer efforts that the church assists with in its on-going relationship with the school. The children in the Plant and Share Club are raising veggies that they provide to a local soup kitchen. They also will have the chance to experience taste testing and many of the other wonders of planting and harvesting their own food. The church and the school hope to expand and build upon the gardening project through the coming months and years. Start small. Work with the school to develop a sustainable plan. A guideline is available at foodcorps.org. Involve teachers, parents and community volunteers. Let sources for garden supplies know you are working on a school garden. Earth Farm Organics in Gaston County, North Carolina, provided soil at a discounted price. Ritchie Sawmill in Mount Pleasant, North Carolina, cut most of the lumber at no cost. Avoid using treated wood. The chemicals have to go someplace and that means they will end up in the soil. It’s best to avoid treated wood when small hands will be coming into contact with it. Some of the wood in the big box stores simply won’t last long – it’s either treated, it’s likely pine which doesn’t last long, or it’s cost prohibitive. Davidson College Presbyterian Church purchased Eastern red cedar from a nearby sawmill. Cedar holds up much longer than some of the other wood that is available. Ask for the Eastern red cedar; western cedar is cost prohibitive for most school projects. Invite volunteers to help. People with a wealth of expertise usually show up. Ask volunteers to sign in and indicate additional ways, if any, they would like to be involved. It’s a good way to learn who wants to work with the children in art, cooking, science and other projects in the garden.